The Book Companion Site for STAT2 was replaced by LaunchPad! Access to the same resources is now available at http://www.macmillanlearning.com/launchpad/stat2. 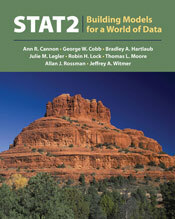 STAT2 offers students who have taken AP Statistics or a typical introductory statistics college level course to learn more sophisticated concepts and the tools with which to apply them. The authors' primary goal is to help students gain facility in the use of common statistical models. The text instructs students on working with models where the response variable is either quantitative or categorical and predictors (or explanatory factors) are quantitative or categorical (or both). The chapters are grouped to consider models based on the type of response and type of predictors. 1. Choose the appropriate statistical model for a particular problem. 2. Know the conditions that are typically required when fitting various models. 3. Assess whether or not the conditions for a particular model are reasonably met for a specific dataset. 4. Have some strategies for dealing with data when the conditions for a standard model are not met. 5. Use the appropriate model to make appropriate inferences.